Duong Minh Cuong’s is the only family that is able to make a living from this profession, he says. 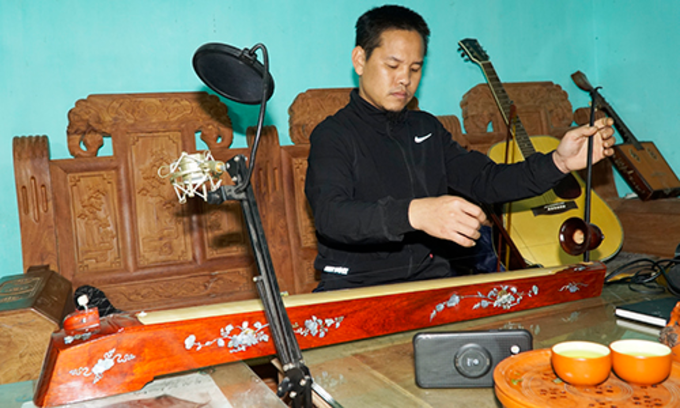 In the last 2 years Cuong has borrowed money to buy machines to make instruments, and his production has tripled. Photo by VnExpress/Trong Nghia. Situated in a small lane in the middle of the village is Cuong’s house. The house is unlike most others in the village, with the smell of paint and wood drowning out the odor of poultry in the surroundings. It is also filled with the sound of music and machinery noises. 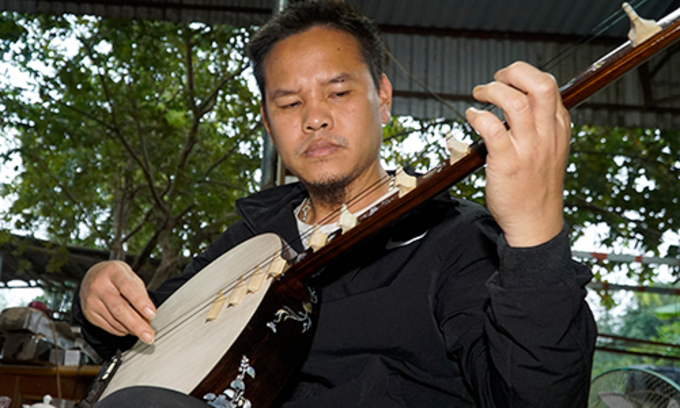 In the beginning Cuong, 37, specialized in making guitars and mandolins. In 2004, realizing that more and more people were making guitars while traditional instruments were becoming increasingly rare, he decided to learn to play these instruments. Within a year he could play nearly 10 different instruments and started making them. However, his income was meager. In 2010 he and his wife moved to the capital and set up a north-south transportation service. With two years they ran up a debt of nearly VND1 billion (VND43,100). They returned to their hometown and to instrument making. But their difficulties persisted when Cuong was diagnosed with depression. He refused to communicate with anyone and it took two years for him to finally get over it. As the illness wore off, Cuong was keen to find business partners and spent a lot of time talking to customers to find their needs. Though many local artists specialized in making erhu, most customers preferred Chinese products. Realizing this, Cuong bought 10 erhus from various places in China for more than VND20 million ($862) to study their composition. It turned out the instruments were made using seven or eight layers of wood, and they produced good sounds but flaked quickly while their prices were no cheaper than that of Vietnamese products. He later chose solid wood with the same thickness as the Chinese ones to ensure good sounds. His erhu was well received because of its durability, sturdiness and low price. In just one year the number of his customers has tripled and he also sells other products. With the erhu, he used to ruin hundreds of pieces of varanus skin and python skin. Stretched over the sound diffuser of the erhu, the skin sagged within a month and needed to be replaced. He later learned to stretch the skin in proper weather, which is neither too wet nor too dry. It was only after this problem was overcome that his products became profitable. A unique feature of his instruments is that many of them are engraved with patterns that are distinctly different from products made by most craftsmen in Vietnam. Cuong checks his instruments carefully before handing them over to customers. Photo by VnExpress/Trong Nghia. Cuong’s wife, Nguyen Thi Nga, 34, says: “He often stays up all night to search for beautiful sounds. My sleep was often disturbed by the sound of my husband playing instruments. I slowly got used to it”. Six years after returning to the profession, he has a workshop measuring hundreds of square meters and is trusted by many artists. He personally delivers his products to retail customers even if they live hundreds of kilometers away. His products are sold in more than 10 shops in Hanoi. Cuong invested in a modern sound system so that online customers can feel the sounds. Photo by VnExpress/Trong Nghia. Every day after finishing work Cuong spends around 10 minutes playing his instruments on live stream for customers. Every time he gets on “stage”, he attracts hundreds of followers. After two years of promoting his instruments in this manner, his revenues have increased significantly. This year he plans to expand production and train more workers to preserve the traditional craft in his village.